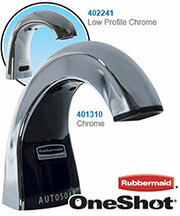 The new Optima® Automatic Faucet and Soap Dispenser A perfect combination. 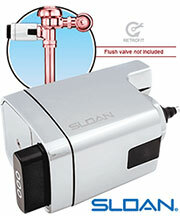 Optima ESD-25085 and ESD-20080 Combo electronic hand washing automatic faucet and automatic soap dispenser. 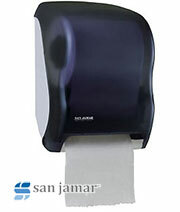 Perfect for hand washing Hygiene in all Restroom Applications. The ESD-250 battery-powered model is ideal for retrofit installation, replacing existing dispensers and installations where wiring is not convenient. The user's hands reflect the beam into the sensor receiver there by activating the pump allowing a single soap application to flow from the spout. A flashing red LED indicates the soap cartridge is low. A flashing yellow LED indicates low batteries. 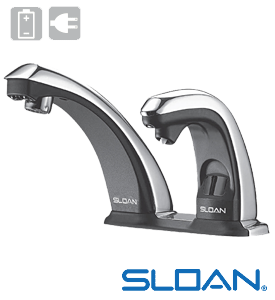 Simply insert spout, line up the guide pins, and install motor assembly. Attach battery pack. Install the soap cartridge using the base of the cartridge, lock into place and press the reset button. Tighten all appropriate fittings and you're finished.